On Thursday, offensive coordinator Marty Mornhinweg, defensive coordinator Sean McDermott and special teams coordinator Bobby April held their weekly individual press conferences. Mornhinweg talked about getting running back LeSean McCoy more involved with the offense at the start of the game rather than waiting until the third quarter to get him touches. Additionally, Mornhinweg touched upon the mistakes that QB Kevin Kolb made against the Green Bay Packers and what he thought of Mike Vick’s performance. As for McDermott, he dissected and analyzed the performance of safety Nate Allen against the Packers and explained why DE Brandon Graham has been lining up at defensive tackle so much. He also discussed importance of having his three starting linebackers and his gameplan for slowing down star wide receiver Calvin Johnson. The last man at the podium and perhaps the coach with the biggest questions to answer was April. Last week, Packers kickoff return-man Jordy Nelson nearly returned three kickoffs to the house during the second half (three straight kicks to mid-field). April believes one of the reasons is due personnel reasons. With Stewart Bradley going down with a concussion, LB Omar Gaither was forced to play middle linebacker and taken off special teams. Additionally, April says he has to do a better job detailing to the players what needs out of them. "Alright, that last ballgame we were disappointed we didn't win the game. Certainly we had our opportunities and they played well. It was more about us that ballgame. We're going into this game, we've got a great opportunity; great challenge. Detroit's defense, their front kind of anchors that defense; very, very good, highly talented. So we have our work cut out for us. We've got a great challenge there up front. We'll open it up to questions." "Yeah, we'll use all of our eligible runners and receivers and he's one of them. He's very good. I thought he played well that last ballgame." "Yup. He did well, he played well. He can play even better. That's like all positions after that last game. We all can play a little bit better. Made some mistakes there, off and on, and it just disrupted us, so we've got to be a little bit more consistent." "I'd rather not talk about that. We have Owen Schmitt in and he's our fullback. He's had a good practice yesterday, a good walkthrough yesterday, a good practice yesterday, a good walkthrough just now, so great confidence in him. He's been in this terminology before, so he's pretty sharp. He's a big, physical guy." "Yeah, just a little bit. Early here and then once Owen gets a real good feel, a little bit more, a little bit more. Normal management with a new player. He's so new, he got here just days ago. Expect him to play at a high level. He's a smart guy and his preparation is very, very good up to date." "Well, he stopped one of the goal-line plays down there, simply by penetration. He's a very strong man and so, like I said, we'll have our work cut out for us. They stopped the one play down there to make them kick a field goal and then later in the game, they stopped them four straight plays; three runs and one pass. He was a big part of that." "Well, that's right. You only have so many plays on a man. Our guys are used to watching literally hundreds of plays on their opponent that's going to be lined up more near them. Just hundreds and hundreds of plays, so we have a select few there for him. I think it's enough to get a pretty good feel on how he goes about his business and then they learn something every week, new players do, and they usually add something to their repertoire. Did I say that right? And then you have talent like he does, and that's a good challenge for us." "Well, the personnel, top to bottom, is much different. Yeah, it's just a whole different squad there. On defense, I believe they have as many as 17 different players and I believe it's eight that are starting. And they have a quality guys. They've got a five-time Pro Bowler in (LB) Julian Peterson and they've got an excellent front. He's a five-time Pro Bowler, so they've got some excellent players on the defensive side of the ball." "Yeah, they're a little bigger. And I'll tell you what across the board they've got a couple backups that we'll play. 93 Kyle Vanden Bosch is a heck of a player and he plays the game the way it should be played; high motor, he's making plays 20 yards down the field from the opposite side. 92 Cliff Avril, on the other side, is a heck of an end. They're very big and very physical inside starting with Suh, we talked about him on goal-line. Their front is just excellent and this will really be a good challenge for us." "Great confidence in Mike McGlynn. That's too bad about Jamaal Jackson. He's been through a couple of long rehabs with two major surgeries and this is a third one. I've been through this before, sometimes several things happen and then they stay healthy for five, or eight, or ten years even. I think that's a little cyclic for him and he'll come back from this, Jamaal will. Great confidence in Mike McGlynn, and the good thing is, he got an awful lot of reps in training camp and in the preseason." "Yeah, that will be important. That's important. It was important work, that was my point, yeah." "Look, I do know now that we've got to get the quarterback help; that's first. Then second, there's a couple of things there that I would have liked to see him do the right thing on, do a better job there. It's very difficult to get an evaluation in such a short number of plays there. He'll be fine, yeah." "Oh yeah, every quarterback in this league no matter how tough you are, if you continue to hit the quarterback – that's why those pass rushers are so important. It distorts the decision-making just a little bit. There are some quarterbacks in this league, you've got to do it early and often and all the way through the game to have any effect at all. Others you can get to pretty quickly." "Kevin's a tough guy now. Kevin's a tough, tough guy, so I wouldn't expect that at all, no." "Well, he had more plays. He had a bunch of plays. I think we ended up with 60, a low 60 amount of plays and then we just had very, very few in the first half and that was our responsibility to continue drives." "Well, there's several different ways and schemes that people will quite possibly use on Michael. Spies, mush rush, contain; five man rush to try to free up the lane, the running lane – those type of things. All of those are possibilities from, virtually, any team and certainly there are counters to that." "There's two ways – Mike does that naturally and then schematically, you can get into a whole host of things. Those are always possibilities there." "Well, it's a little different last week because we were trying to race back. We just had to do that. Mike is very effective in the running game as you saw. I believe it was the third preseason game, he goes in and he hands the ball off. Taking care of the backside, the safeties might just be a touch later, expecting Michael to end up with the football. So, no, I think that could end up being a positive for (RB) LeSean McCoy and (RB) Mike Bell and the rest of our backs." "Yeah, we've been through that before. It's cyclic just a little bit. There will be games where he catches a bunch of balls. I would suggest, I would think there will be others where other guys are catching the ball. Certainly tried to get it to him down the field several times. Got it in underneath several times to him. That's a real fine line there. Look, when we don't have it down the field to him, we've got to complete the ball and gain yards." "Well, I always like to get DeSean involved, yeah. I like to get (TE) Brent Celek involved, I like to get our halfback involved, I like to get WR Jeremy Maclin involved, I like to get them all involved." "Oh, outstanding. He's been here a short period of time and he's another real smart guy. His preparation has been excellent. Sort of a natural player, so things come easy to him that way. He's done well." "Oh, I learned an awful lot and, you know, the roster has changed quite a bit. I believe there are two men left there. That first draft that I was heavily involved in, we got (DT) Shaun Rodgers who's now not there and then their starting left tackle and starting center. Trying to build that thing inside out. Those two guys are winners and they've been through some tough, tough years; just tough, tough years. They're much better talent-wise. They've done a pretty good job here in recent past history on building that talent. Now, they had a bunch of high picks in every round, so they've done a pretty good job there. Listen, that was a great experience. The old saying, you learn more when – then you find out about people when things aren't good. You know? I thought the one thing that I was proud of is that all those players, man, they stayed together and they fought. Then you go back and look at the thing, we had 10 straight single-digit losses – or 10 straight single-digit games and won one. They stayed together and they fought. I was proud of that. We were outmanned virtually every game, now they're getting to where they're matching up pretty good against people. Well, they certainly did against Chicago last week." "Yeah, about a quarter and a half and they did a good job. Having (LB) Stewart Bradley back was a big asset to our defense." "Well, that's the life of a guy that didn't start for a particular game and that was Omar's situation last week. He has to get ready to go and knowing he was backing up that middle linebacker position, so that's the life of a National Football League backup in terms of Omar's situation last week." "I believe he's started close to 30 or 34, 32 games, somewhere around that number and he's done a good job and having worked with Omar over the years I have a lot of confidence in him and I think his teammates have a lot of confidence in him, as well. So, it is like having a fourth starter when he steps into that role." "Well, philosophy is one thing and game plan's another. So, if you can get four-man pressure, then why not stay with it. And we had four-man pressure last week. But, the ideal situation is a mix of both, pressure and four-man." "Yeah, they did a good job. There was good four-man pressure on the quarterback, as we all saw and it resulted in three sacks. And then the pressures overall were just a combination of blitz pressures, and four-man pressures, and the ball came out extremely fast." "It is, it's a week-to-week situation with all of the players. In terms of his situation last week, as you mentioned, he's a good football player and we look forward to getting him on the field very soon." "I don't think fall out of the game plan is the right choice of words, necessarily, but they're always in every game plan and they do a tremendous job for us. So, having those two rocks inside is important for the overall core of the defense and I thought they did a good job last week." "Week-to-week. Week-to-week, honestly, and he's going to be moved all around. I wish we had eleven of him quite honestly, but he can't play more than one position at a time, unfortunately here. But he was productive. 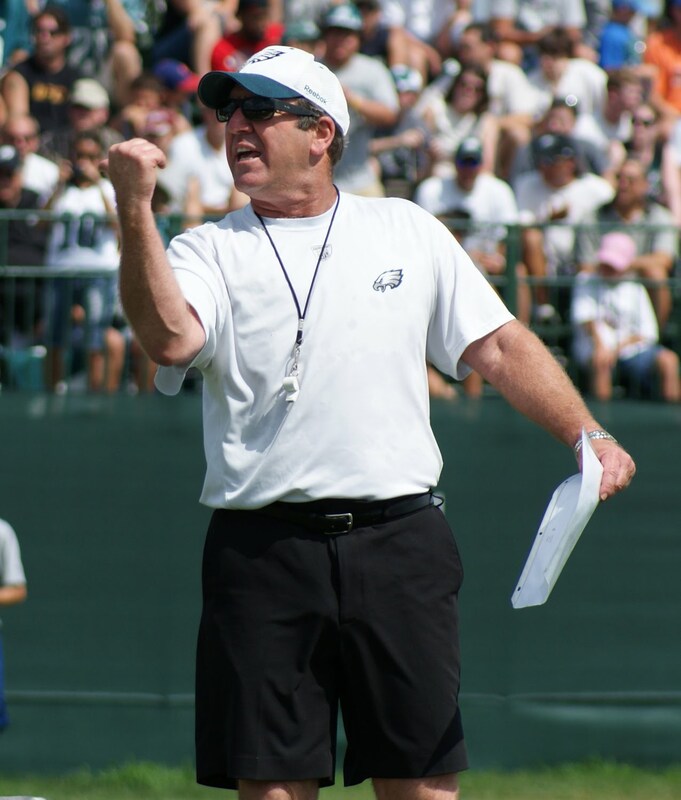 He was productive outside, he was productive inside, and then particularly on (S) Nate Allen’s interception he got great push and the quarterback sailed the ball because he couldn't step up in the pocket and that was due to Brandon's presence inside." "Right, that's a good question. The presence inside, it's important to have a push, when you have speed on the outside. And Brandon gave us that push on the inside, as I already mentioned, in particular causing a turnover." "Well, he's a veteran quarterback, so he has seen the blitz looks, he has seen single high safety, split safety looks, and he has great football instincts. So, I'm sure he's well prepared to do a good job for them." "Well, just like last week, some of the matchups, this guy is extremely talented. And you watch him on film and he can turn the tables in a hurry, not only just going up for the ball, like we saw last week against the Chicago Bears, but also run after the catch, and he's tough to bring down and he can take it to the house. So, he brings a tremendous challenge to this defense." "I don't know that. You would have to ask (head athletic trainer) Rick Burkholder at this time." "Well, he's still very talented and mobile. He presents a challenge to any defensive coordinator that you have to defend eleven on the field instead of just defending ten because of the run/pass combination that he brings to the table. He can give you headaches." "I think he's improved certainly since he's come here just working with the coaches and in our system and you see him out there and it's a result of his hard work. You see him out there most every day with (quarterbacks) coach James Urban or (offensive quality control) coach Doug Pederson and working after practice on his throwing." "He did well. Again, how he handled himself we were impressed with. Now, are there things he can work on? There are, and he's going to work on them this week so that when he takes the field come this Sunday he's an improved player and Nate will be the first to tell you that. But, overall did a nice job." "Well, we left a couple plays on the field just from an execution standpoint. They're a great offense and I'm giving them credit number one, they force your hand on some things, but it was more of unforced errors on our part. But, overall I was somewhat pleased, like you had mentioned, a couple of the quarters in particular. And then, we had a couple series where it was too easy for them." "Well, we have a limited number of people who we can choose from, so there's not a whole lot of changes that we can make. We have a guy or two that maybe out of there, (LB) Omar Gaither is one, because he was going to play there on kickoff coverage, and then when he was in on every defensive play, we didn't tax him that way, so we took him out. Some of the other guys on the edge, who played, or who may or may not play depending on who dresses, that's yet to be determined. When we're dealing with 40 through 53, half of those guys are not going to dress. Usually I know most of them and they're not all special teams players either, some are offensive lineman, that type of thing, defensive lineman, that don't play. But we pretty much have the same personnel and we've got to get the personnel better." "Well, we just try to do a better job detailing what they have to do. There's a short presentation, and it's not all day, it's not every day, on what we can meet with those players. There's ways to improve by me being better in presenting the information, maybe a little sharper, crisper practice, maybe a little more drill work on specifics that we're not doing well, like getting off blocks." “Yeah, it was not good. The thing about that particular play, it's a critical play for a lot of reasons. One, it's the first defensive play of the series. Nobody generally thinks of it that way, unless they are really great or really terrible, sometimes they go on in almost anonymity throughout the season, but that's the first play of the defensive series. If we have the chance to literally establish the field position for our defensive football team with one single play, so it's critical that that one single play to determine that, is good. Throughout the preseason and even early in this game when we had an opportunity to kind of seize a little momentum with just scoring, or coming out after the half, or late in the game to set the tone for our defense, we have not done it. So I just have to do a better job, and in retrospect, look at how we organize the offseason, the OTAs, and even training camp, what kind of priority we set on that area. It's to be questioned at this point, because it's not even remotely up to what we need it to be and I have to take responsibility for that." "(CB) Ellis Hobbs, really nothing. We had a pretty good starting point, the 30, but we didn't block it very well. We've got a ways to go, maybe more on the kickoff return than on the kickoff coverage, because on the kickoff coverage, a guy or two has to elevate their games, has to make a little better judgment, has to do a couple of things a little bit better. You can pretty much for the most part learn and become better at it. Where on the kick return, all 11 guys have to be in concert, and that's tougher, because there's more moving parts to that one. We're not as sharp, as crisp on that as we should be. The results, if you just went by, they were okay, marginal, 23-something on the return. Thirty-yard starting point, part of that's because they kicked the ball out of bounds, but that's their problem. We've got a ways to go on that, we've got a ways to go. Everything I said about kickoff coverage, the exact same thing is true about the kickoff return. That's the first play and that's one play that, right now, can establish the field position and the tempo of the offense. Before they do anything, you can pick up two or three first downs for them, and they don't even know what the return calls are, but you're doing that for them and that's the beauty of special teams, that's the beauty of that contribution. So, they are critical plays and the reverse of it, obviously is, now they just scored, we've got to recapture that, so it's flipped, but we've got a ways to go on that, too." "I think so. I think you have to realize wherever you're at, we've got to get the most out of what we are. If we're a quart, we need to fill that quart all the way up. If we're a gallon, we need to fill it to the gallon. If we're a fifty-five gallon drum, if you get what I mean. We have to maximize everything that we possess, so that's where we are at right now. Granted, we do have to use only the games as our true measure of reaching that potential, because just with the structure and the way football is, it's hard to cover kicks full speed and live other than in the games." "I think head coach Andy Reid would have the best answer to that, because he decides who dresses, but he's certainly a guy that can return. Whether he dresses this week or not, he has a real valuable role to our football team as the backup returner, especially, with (WR) DeSean Jackson having not done a whole lot in training camp. I think the thinking was he was a valuable backup, and certainly he played on special teams, as well. He played on some of the other stuff, even though he wasn't returning, he played. I think it was more of that. It could have been that they felt like they needed him on defense. That part I don't know and I wouldn't need an answer for anyway." "The primary thinking on that is fielding the ball, managing the ball. If you noticed, the one was kicked to Jackson right down the middle, the other ones he kind of had to run over to the sideline to catch the ball. So, this guy was more of a directional kicker to his right, and we wanted to play for that, and we did play for that. The results weren't as good as we'd like." "Usually it's more because of the punter you're going against, yeah. Having two guys back there, the reality is, in my mind, have two guys back there is the best way to do it, because whenever that guy is reaching with his hands or drifting with his feet, he's got a higher probability of dropping the ball, and managing the ball is the number one thing that guy has to do. It's really not, in my mind, running with the ball after the catch, it's managing the game. Catching it, knowing when to fair catch, securing it, knowing how to play inside the 50, doing all of those things. That's the real quality of playing that position. For eight plays, you manage that thing just like a quarterback manages third-and-long. In my mind, that's what it is, so the best way to help him manage it is to give him only half the field. We won't do that all the time, but if a kicker's going to kick it out of bounds to the right, sometimes you can dictate some things, like the kick that went down the middle that DeSean Jackson did return for 10 yards. We overloaded the right side and rushed him. Now we don't have a lot of blockers when we do that unfortunately, and that was in our plan too. We didn't make him punt as many times, to use it over and over, he tried to punt it to his right, and it went like that to the middle on a low hang, and he got a 10-yard gain. So you're always in kind of a chess match on some of that stuff, but I've got no problem with two deep, and especially where I came from in Buffalo, the weather conditions, you're asking a lot of a guy to manage the 53 yards and possibly 60 yards the other way on a really bad weather day." "I was kind of surprised that the Steelers let him go to begin with, because he was a good return guy for them last year. I'm sure they had good reason for that, I don't question it, I just was surprised. I think he's really explosive. I think he adds a lot to their offensive football team. He's a guy, again, he can establish that first play of the offensive series by his ability. He can make a guy miss. He doesn't have to have all 11 guys in concert to get it done. I'm impressed with him. I'm really impressed with him. I watched him last year, and I know they were high on him. The Pittsburgh organization was high on him last year, so I'm not sure what happened, but it's a good move for Detroit." I have to say I am a little scared that the Lions defense might come together and do a number against us. I'd be more concerned that the smallish corners of the eagles guarding Calvin Johnson. last time the eagles faced the lions, their wide receivers had good games. However, the interior line has to be good against Suh otherwise they will struggle to move the ball and run.